Welcome to EFR Racing, Inc.
With 50 years of experience, Elton Fish's EFR Racing, Inc. is the most extreme high-performance motorcycle shop that has been putting all types of bikes to the test — from racing Harley Sportsters to all-out turbo bikes! Once I thought I was out of it, they pulled me right back in... working on Harley-Davidsons! Contact Elton via e-mail at EFR Racing, Inc. which is located at: 27 W 161 Childs Street, Winfield, IL 60190. 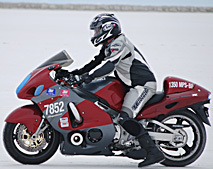 Top end speeds at Bonneville are fun! The new EFI box has a lot of new options for turbocharged and aspirated motorcycles. EFR's new 1400 CC displacement and 1360 CC displacement Blackbird engines are available now! E-mail for details. EFR's Big Bore Kits available now! 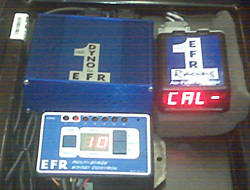 EFR's Stroker Kits available now! NOTE: Turbo kits and parts are not sold separately — only with installation. Thank You! Monitors and corrects the fuel at all times. Very clean installation. 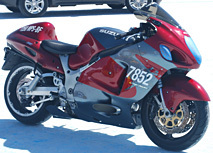 For Hayabusas, Honda Blackbirds, and GSXR 1000's. More parts and upgrades on the Performance Parts page!